Hit The Best Tweed Valley Trails! The Tweed Valley Shuttle lets you ride the best trail networks in the Tweed Valley with pick up points at: Innerleithen Trails, Innerleithen - I-Cycles, Glentress Peel, Glentress Buzzards Nest & Kingsmeadow Car Park, Peebles. Leave the car at home and let us do the driving! Please note the Valley Shuttle will only run when pre-booked during the winter months! From A to B and back! For example Peebles to Innerleithen and return later after your ride. 10 Uplifts to Buzzards Nest to be used as either a day pass, or make it last over a couple of weeks. Up to 16 uplifts in a day for Mums, Dads and children under 16. Both parents do not need to ride as the uplifts are per person. Check in with your Valley Shuttle driver with your ticket QR code! Not booked on? Not a problem, our driver can take cash, card and contactless! An excellent beginner route through Glentress's oldest, tallest and most magnificant trees. This trail starts and finishes at the Glentress Peel Visitor Centre. The route has gentle gradients and mellow bends that are a perfect introduction to mountain biking. A fabulous trail that provides stunning views of Peebles, the Tweed Valley and the surrounding hills. This purpose-built singletrack route starts from the Buzzards Nest Car Park, which is sign-posted from the forest entrance. It’s a fair old pedal up to the car park from the bottom of the forest (only 2km, but lots of climbing) so driving up is advised unless you’re feeling really fit! This world famous route is sure to put a huge grin on your face with its technical climbs, fabulous views, fast flowing descents, jumps and berms. The Red Route delivers some of the best riding in the country, including the legendary 'Spooky Wood' - a stunning 1.5km singletrack descent with sweeping bermed bends. 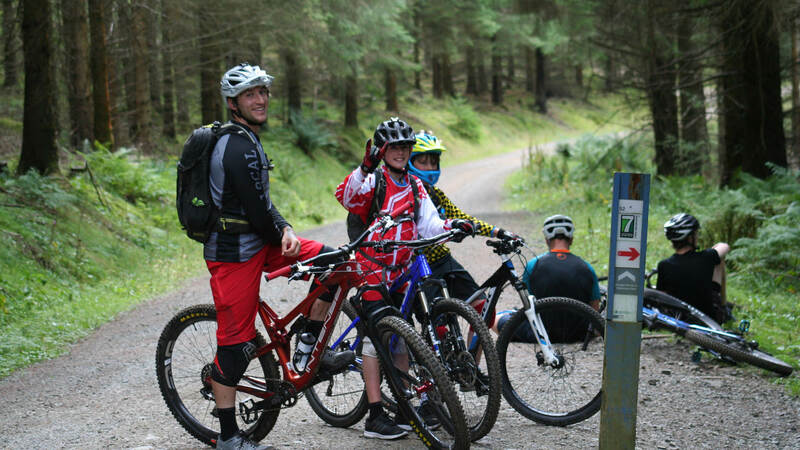 The route's best ridden from the trailhead at Glentress Peel and is recommended for experienced riders only. A long, technical ride that includes epic climbing and thrilling descents. Packed with epic climbs and nail-biting descents that’ll make you smile from ear to ear, the Black Route is a physically demanding ride. Packed full of advanced level features, the Freeride Park is an ideal spot for riders looking to push their skill levels, style it up, learn new tricks or just hang out and ride with friends. It's located right next to the Buzzards Nest Car Park. Check out the range of features big and small, which are perfect for practising your bike skills on. Whether you’re a novice freerider or a seasoned pro, there are areas built to suit all levels of experience. Read the onsite info panels before you jump on your bike. Multipass and Family Passes maximise you and your family's ride. With up to 10 drops at Buzzards Nest a day there'll be no more dragging unwilling pedalers up to the fun stuff!! More runs for your money - maximise your ride with a multipass or treat the kids to a day out with the Family Pass! Use it all in a day or spread out the rides. Some of the UK's best trails! Internationally renowned, our trails are ridden by both downhill and enduro riders. Ride the Innerleithen trails in the morning and hop on the shuttle to Glentress for an afternoon, hit up the best Tweed Valley Trails without the faff! Looking to ride quicker, better, safer? Book and ride with a coach and feel the progression! Just visiting or new to mtb? Then choose Adrenalin Uplift's rental and demo fleet for bikes, protection and clothing. Mid Wk / Wk End packages inclusive of travel, bike delivery, accommodation, uplift and more from Adrenalin Rehab. We accept all major Credit & Debit cards through the secure payment platform.